When I was pregnant, I was amazed and frightened by how many people told me that I should go out as much as possible now because once the baby was born, there wouldn’t be any time to eat out or try new restaurants. So when my daughter was born, I made a firm decision that she was going to learn how to eat out and not just at places that had kids’ menus. With that in mind, I started testing out restaurants in the Omaha area to see what places were kid-friendly, but not necessarily kid-oriented. Where can I bring my child to that doesn’t only serve chicken fingers and fries? 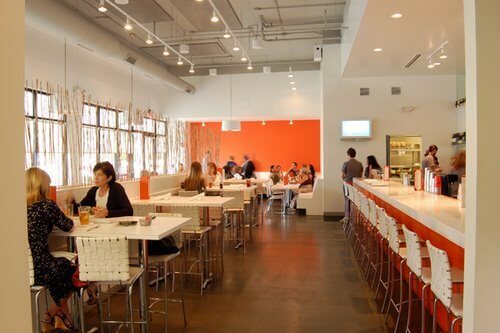 With my three year old daughter in tow, the first place I looked was Blanc Burgers & Bottles at Midtown Crossing. Seeing that I ate here through most of my pregnancy because of my addiction to their cheese curds, I was excited to see what life with a child would be like. Not only did they have high chairs, they did actually have a “petite blanc” menu that went beyond chicken fingers and fries. I opted for their mac n’cheese and was hesitant because I feared it would resemble something put together with cheese powder and dried out pasta. However, I was pleasantly surprised that the ditalini (short tube pasta) was made with real cheese and was not only tasty for kids, but something I would be tempted to order next visit. And the fact that it comes with fresh vegetables or fruit and a drink for only $6 was even more inviting. The icing on the cake was when the waiter brought over a mini etch-a-sketch for my daughter to play with while waiting for our order to arrive. A few weeks later, we decided to try out Nicola’s In the Market, a small Italian restaurant on 13th street in the Old Market. Although they do not have a kids menu, the portion sizes are large enough to share with your children. The small, cozy restaurant seems reminiscent of stepping into my grandmother’s apartment in New York for Sunday dinner. The smell of homemade Italian food fills the air and the fresh bread and olive oil are waiting for you at the table. You can keep your order light with a chibatta bread Panini or salad, or you can choose a more filling entrée of pasta served plain, with meat or seafood. Additionally, you can even “grande” your meal for a larger portion – perfect for sharing with children. Manager Corey Caughlin believes the portion sizes are great for families, “Prices are family friendly for the quality of food and portion sizes. Desserts are fantastic too – something always nice for a family having a birthday or special celebration.” There are no high chairs at this restaurant so you will want to keep that in mind and make sure that you plan accordingly. After going to Jackson Street Tavern on a date night (yes, you still get to go out on date nights when you have children as well!) we decided to bring the kiddos next time we went. High chairs are available, as well as a basic kids menu. However, there really isn’t a need to order off of a kids menu when the restaurant offers a small plates menu. Instead of eating a hot dog or pasta, kids can have an opportunity to eat lahvosh, or bruschetta, or steak on a crostini. Appetizers are a great alternative to kids’ menus due to portion size and give them an opportunity to try new foods. It might have moved to Council Bluffs, but Dixie Quick’s still has the same down home, quirky yet tasty appeal of its previous Omaha location. At Dixie Quick’s there is something for everyone – from the art on the gallery wall, to the brunch menu that will make you salivate, children are always welcome at this restaurant. A personal favorite at our house is the Sexual Chocolate waffles (named after Eddie Murphy’s band in the movie Coming to America). Yes, yes, I know – how can something with the word sexual chocolate be kid-friendly? Well, take the title of the dish away and you are left with a tower of waffles covered in chocolate syrup, banana slices, nuts and whipped cream. What kid would say no to that for breakfast? Owner, Rob Gilmer, wants kids to see the dinosaurs scattered over the restaurant because he wants the kids to be occupied but still exposed to adult-life in dining. He explains, “When people ask us – is the restaurant kid friendly? We ask them if their kid is friendly. It’s an adult world and so you have to have your kids adapt to it. We don’t have a kids menu because they usually don’t have nutritional value – we don’t have an adult menu – we have just one menu for everyone.” And if you are a fan of the movie Little Shop of Horrors, be sure to check out the Audrey II plant in the back – it even sings!